Before I get to the write-up, I want to inform listeners who may not know: “Marie Kelly” is a pseudonym of Wall Street Journal crossword editor Mike Shenk (it’s an anagram for REALLY MIKE). In past posts, I’ve strikethrough-formatted “Marie Kelly,” and added Mike Shenk’s byline. But people have told me they didn’t know why I was doing this, and I’d like to clear that up. Mr Shenk, like several other editors, regularly publishes under (predominantly) female pseudonyms; the Fiend’s Jim P. and Nate, who cover most of the weekly WSJ puzzles, make sure to note these, and a blogger unrelated to the Fiend has cataloged most of them. I’ve been told that — since Mr Shenk constructs many of the puzzles that the WSJ publishes — the pseudonyms are a way of introducing variety into the byline. But why? Why not just claim authorship? Plenty of constructors write most of the puzzles for certain venues. My perspective: When male constructors publish under female pseudonyms — no matter how clever the anagram, no matter how nice and kind a person might be otherwise, no matter if zero harm was intended — it compromises the integrity of the constructor community, deceives solvers (some of whom are angry when they learn of the deception), and may undermine efforts by people who are doing the hard work to make this community more diverse and more welcoming. I see an unfamiliar female-sounding byline in the WSJ — and I’m immediately suspicious. Should I be amplifying a new woman constructor and celebrating her achievement? Or is it just another pseudonym? Using female bylines might make the community seem more inclusive, but it does nothing to welcome (and may even discourage) new talent. I bring this up not as a personal attack, nor to cast aspersions on anyone’s motives, but in hope that the crossword world — constructors, editors, solvers, bloggers, commenters, podcasters, tweeters — is strong enough that we can have civil, public conversations about what we value, about how to welcome diverse voices and perspectives, and about how to make ourselves a better and more inclusive community. Oh right, the puzzle! That’s why you’re here. As someone who feels rather alienated by the overwhelming cataclysm that is mainstream American Christmas culture, I try hard to achieve that seasonal spirit of tolerance, just like [20a: “Keep Christmas in your own way, and let me keep it in mine” speaker]: SCROOGE. I have to admit, though, that the seasonal songs I tend to like are somewhat more emotionally complicated. This entry was posted in Contests and tagged Mike Shenk. Bookmark the permalink. 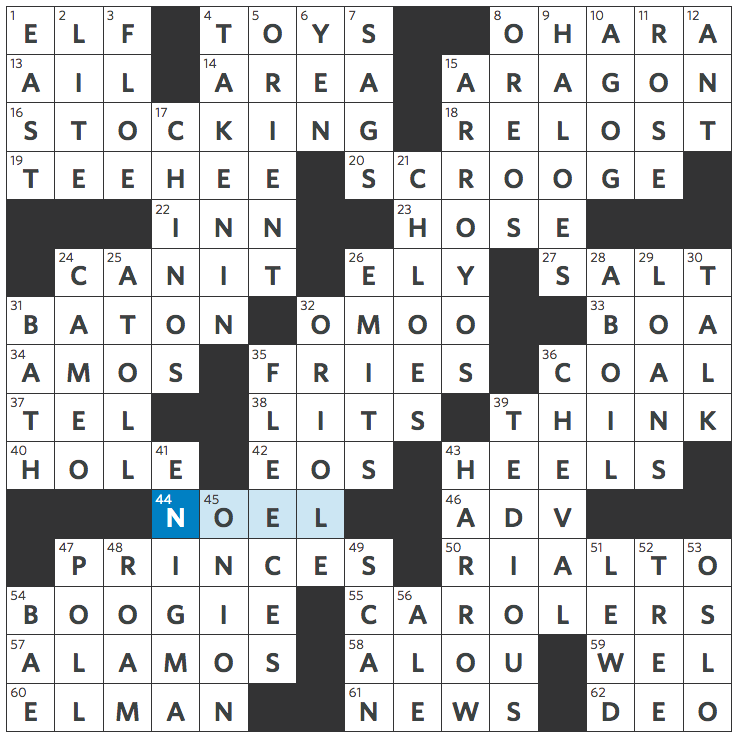 My holiday wish is that all male crossword constructors stop using female pseudonyms. For all the reasons Laura lists, and many others. I assume a fundamental good in people, and believe this behavior is well intentioned. That being said, it really needs to stop. I agree completely with Laura’s perspective and Conrad’s wish above. I’m for ending the practice of using multiple pseudonyms and especially for ending the practice of male editors using feminine names completely. I have to agree totally. And while lack of diversity and a cavalier attitude toward women setters are killers, I would hate the practice anyway. If there’s a presumption that editors shouldn’t be dominating the writing, a presumption driving pseudonyms, then pseudonyms aren’t going to make it go away. Conversely, if there’s no such presumption, then he shouldn’t fall back on pseudonyms. Besides, I keep saying that he should learn from the relatively low ratings of WSJ puzzles here, and if he can’t find enough setters, he’s not doing his job. I’ve even suggested he quit and just make puzzles, since obviously that’s where his heart lies, and the WSJ puzzles might get a lot better if he weren’t editing himself. As with lawyers and clients, a writer who’s his own editor has a fool for a writer. That said, I got the answer for once, and I admired how, between the EL entries and all the other entries related to the holidays, he packed in so much theme material without too much bad fill. WSJ puzzles…” — relative to what? Are there other better meta-puzzle sites out there? Personally, I find these puzzles terrific. In general, I have only admiration for the ingenuity of constructors in both concept and execution are their creations. Relative to what? Umm, LA, BEQ, NYT, hey you name it. Now I realize that the Times has the appeal to get its choice of setters, but still. And no, I don’t think it’s about frustration. The ratings seem not correlate in even the tiniest bit with difficulty. I think the low ratings tend to be from people who couldn’t solve the puzzles. Hear, hear, “Raul!” Very well said. Would that include Dr. Frankenstein when he made Frankenstein‘s bride? I am the codirector of a project specifically founded to publish, promote, and amplify the work of women constructors, so yes. Jasper, this post reads as if you’re trolling, but I’m going to respond as if you are not and try to give you the full benefit of the doubt. A) I’m not sure what the use is of you trying to draw a distinction between “biological” and “identity” gender. Even assuming that there were a clear difference between the “biology” and “identity”, and there was a distinct difference in solution rate between the two (two VERY BIG “ifs” in my opinion), how would that information better inform the situation? The only way I can see that it could be used would be to provide a finer demographic breakdown of the disparities, and nothing further. B) What does solution rates have to do with construction? That feels to me like you’re implying that there’s a correlation, but I can’t see how that would work. Even IF there IS a correlation, I don’t see why it would matter. C) I seriously doubt that Shortz is consciously discarding puzzles based on gender, because that’s not how discrimination generally works. It’s much more likely that (as a possible example, as I have no REAL clue) that men tend to write terser clues, that Shortz associates with terser clues with Fri/Sat and it becomes self-reinforcing scenario. D) It really does feel like that pun was intended, in so it allowed you to complain about political correctness. But, I do tend to agree with you to words should not be shunned because they “sound bad”. But words and their meanings do change over time, and there’s very little a single person can do about it. E) Actually, that would be a new-woman constructor. A new woman constructor would be when Dr. Greta Frankenstein constructed her first monster. Now seems like as good of a time as any to promote the Crossword Puzzle Collaboration Directory on Facebook – it’s specifically geared toward promoting crossword construction from traditionally underrepresented groups (though all are welcome). Super welcoming, helpful, and chock full of awesome people and resources. Personally the stats I’d like to see are puzzle quality vs gender in the NYT (I suppose by Fiend rating). It is very rare that I solve a puzzle that makes me say “meh” under a woman’s name. I don’t want to sidetrack the discussion from the original post, but leaving all else aside, I’ll just note caution about using the Fiend ratings as good evidence of anything. They’re an extremely flawed metric for several reasons. Has anyone talked to Mike about this directly, or know his view? Laura’s criticism seems so right and reasonable to me, I have a hard time imagining a good response, but I’d still like to hear it. This really isn’t an issue with Mike specifically, but an industry issue. Several high profile editors do this. Mike’s puzzle was just the one that was there. I think everyone agrees that Mike is not a bad guy and had no ill intent, and it’s not really about him, but about the practice in general. That said, I would love to hear Mike and other editors to respond. Not necessarily defending the practice, and definitely not in a way to defend themselves from “attack”. But instead weighing in on why they use pseudonyms and if it is still something that is needed, and if so, why? I guess I’m in the minority here but I have no problem with most of the puzzles being by the same constructor….I guess that’s the reason I enjoy doing the WSJ puzzle. If I like the constructor’s work, why would it bother me that a paper uses predominantly his/her puzzles. As far as the male/female issue, I really don’t care if the constructor is male or female at all. All I care about is whether I enjoyed the puzzle or not. Much adieu about not much. Here’s the thing, though: What is there to gain from having a male editor using female bylines? If the benefit is “It introduces variety to the byline” or “anagrams are fun,” that doesn’t strike me as that good of a reason to continue doing it when the downsides (as Laura noted) are that it gives the puzzle a false image of inclusiveness and diversity while making at least some angry for being deceived, all while there’s already a dearth of published women constructors for the WSJ, NYT, and other newspaper outlets. Those are worse problems to have than whatever benefit there is from an anagrammed pseudonym no matter how playful or how benign its intent. Neither Laura nor anyone else should have to feel suspicious that a supposedly new woman constructor for the WSJ is just Mike Shenk. I’m with her on that. I am in minority, but agree w David Roll. There are so many things to be happy about in the world. And some to be unhappy about. But crossword byline pseudonyms, and the Christmas season are relatively minor things. Let all live and let live folks! Sometimes I can even solve them! Then I went down many fruitless ratholes until the deadline to submit came and went. Sigh. It would have been so simple had I read that correctly!